What’s the sound of four Nintendo DSs? 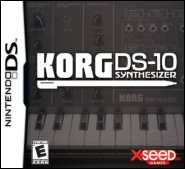 How about four Nintendo DSs playing the Korg DS-10, a fully functioning synthesizer emulator? How about four Nintendo DSs playing the Korg DS-10, but not benefiting from the master-slave syncing available in the program, and instead just doing it by ear? That’s what’s happening on the bouncy, vibrant, at times jubilantly sloppy half-hour jam (MP3) posted this past weekend on the myspace page of DyLab (myspace.com/dylabs), and at acidboxblues.blogspot.com. Further evidence that the DS-10 is no mere extended karaoke act (Guitar Hero, Rock Star), or high-functioning generative novelty (Brian Eno’s Bloom, Toshio Iwai’s Electroplankton, but a full-on instrument.